It cannot be denied that the giant leap in the new iPad Mini 2 comes from its Retina display with an amazing 2,048 x 1,536 resolution, much better than the previous model's 1,024 x 768 resolution last year. No wonder many people are prone to watch movies, music videos, TV shows, etc on this iPad Mini (Retina). However, video files vary a lot in terms of formats, like MKV, MTS, M2TS, WMV, MP4, FLV, AVI, to name a few. And playing videos on the retina-equipped iPad Mini is conditional. To be specific, only when the video files are in the list of iPad Mini with retina display compatible formats (MP4, MOV, M4V, H.264 and MPEG-4) can you import and play video on this second-generation iPad Mini. In order to help you have unlimited video playback on iPad Mini (retina), this article gives a brief guide on how to convert video to iPad Mini with Retina display friendly format using the highly-acclaimed MacX Video Converter Pro. Best video converter for iPad Mini with Retina display/iPad mini 4/iPad Pro/Air 2 etc of MP4, AVI, MKV, MTS, FLV etc with world's fastest speed and no quality loss. MacX Video Converter Pro is infused with preset profiles for the latest tablets and phones, including iPad Mini 4 with retina display, iPad Pro, iPhone Xs/X/8/7/6s/6s Plus, etc. So if you want to convert your favorite videos like MP4, FLV, AVI, MKV, M2TS, etc to iPad Mini (retina), this program is absolutely your solid choice. It takes advantages of the hardware acceleration tech to provide the world's fastest video to iPad mini with Retian Display conversion speed. Below we'll show you how to transfer unfriendly video files to iPad Mini 2 with retina display playable format. Free download this video converter for iPad Mini 2 with Retina Display on Mac computer, install and run it. Click "Add File" button to import the video file you want to add. Or drag and drop the video. This application is preset with optimized profiles for your iPad mini 2 or iPad Air. To do it, just go and hit "Apple Device" -> "to iPad Video" and choose the specific generation of iPad at your fingertips. Then click "Done" button to finish the output format selection. 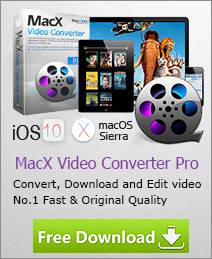 Tips: MacX Video Converter Pro not only helps to convert among SD and HD videos on Mac OS, but also enables to download YouTube FLV to AVI, MP4, MOV, WMV, MKV, etc for playing on iPhone, iPad and Android in a few clicks. Click "RUN" button to start video to iPad Mini 2 (retina) conversion on macOS. After a short period of transition, you can sync the video to your iPad Mini with Retina display via iTunes and play unfriendly video files on iPad Mini with retina display anywhere anytime. Tips: it's also at your disposal to edit the video file before you convert video to iPad Mini with retina display. Just click the "Edit" button on the main interface and then you can trim, crop and merge videos, add watermark and even external subtitle as you like. 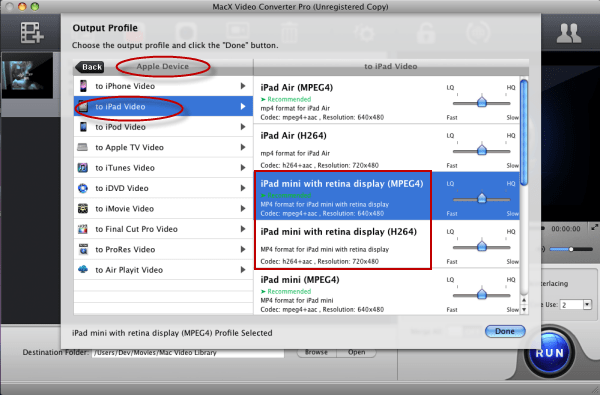 For more information, you can just visit this user guide of this iPad Mini (retina) video converter.